before i get into this i want to address something. 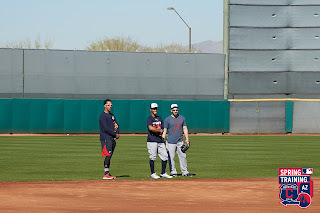 if Michael is not going to play the spring training games that are on the Indians schedule like he usually would due to his continued rehab, then i unfortunately am not going to be able to write a proper Brantley's Spring Training #s blog this year. what i'll probably have to do instead is keep track of all his rehab games, from March until he's activated with the Indians in April or May, and then write a blog recapping his overall rehab. originally they said when Michael does ultimately begin to play in games again, it would be with the minor league camp in spring, AND he would play with them before he's even ready to bat. don't know how you can play in a game without being in the lineup, but i guess they will figure that out. and whenever he does start hitting in games again, if he remains with the minor leaguers, i don't know that i'll be able to find much detailed information online about each game that he appears in (ie. pitch count, inning, outs, results of all plate appearances). odds of me getting his situational numbers (RHP vs LHP, RISP, runners on, bases loaded, etc) are low as well. it also seems unlikely that i'll even be able to do an accurate calculation of his total numbers. so i'm asking my readers to please bear with me as i am gonna be forced to do things differently with the documentation of Michael's rehab/spring game #s.
as always, the best way to see any news and updates that i find on a daily basis would be to follow me on twitter, @clevelandgirl23. okay, so if you're looking for very detailed accounts of Michael's shoulder updates and his hitting program in February, this is the place. i have pictures, i have videos, i have quotes...omg SO many quotes! February 1: in an article on mlb.com by Anthony Castrovince, it was finally revealed what Michael himself thought about all the "the injury was worse than they thought and he might not be back until August" hubbub from December 2015. "i laughed. i absolutely laughed. i didn't actually know what happened, because a lot of family members and friends were calling and texting me. i hadn't even had a re-check from my surgery yet, so whatever information somebody got, it was all news to me as well." geez, i wish that tidbit from Michael had come out right after this exaggerated misinformation broke. the lack of moves made by the organization this offseason can be interpreted as the Indians not foreseeing any setbacks for Michael. it is also now known that the Indians public timetable for Michael's return is sometime before the end of May. and just in case you missed it, at Tribe Fest, Michael told the media that he would be leaving for Arizona on this date to continue his rehab there. 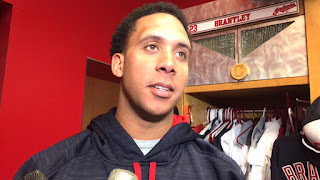 February 2: during Terry Pluto's weekly podcast, he briefly spoke about Michael, saying, "we don't know when Brantley's gonna come back. 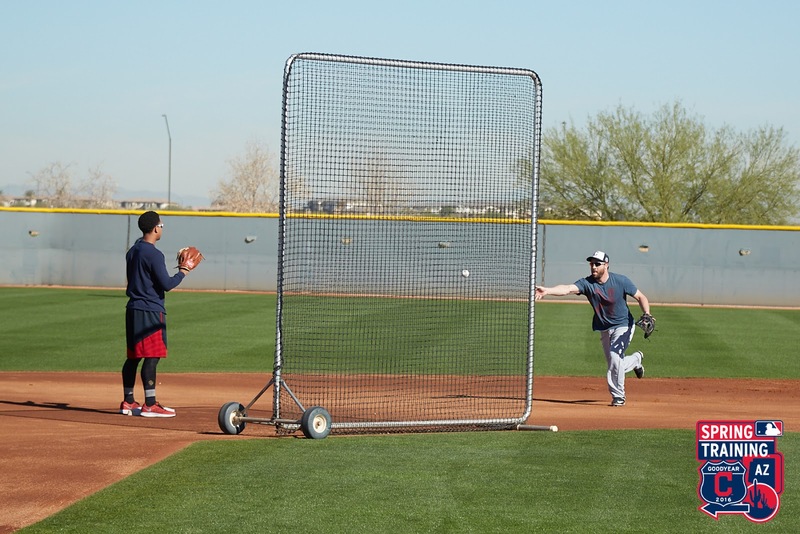 the good thing about Brantley is, that swing he has is so compact, and it isn't one where you need a month of pitching to get your timing back and hopefully it isn't one that puts so much stress on that right shoulder cause he's a left-handed hitter. his swing should put less strain on his shoulder. that's what i'm hoping." 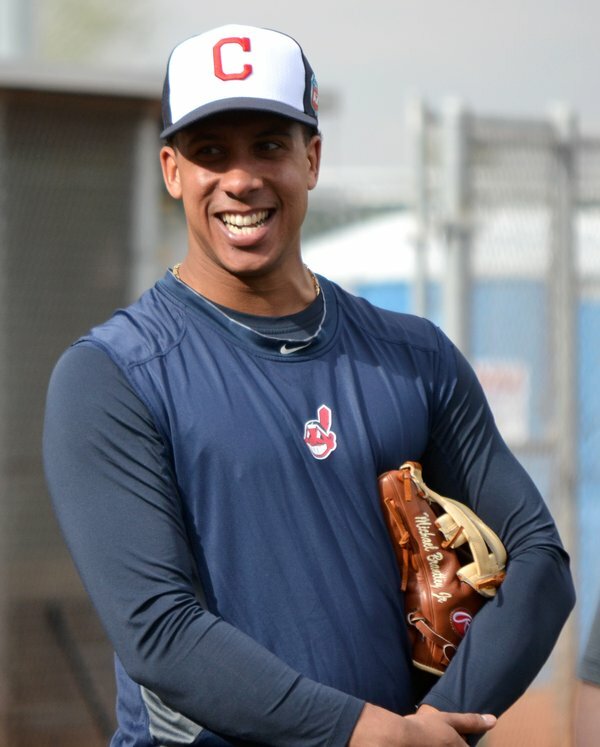 February 13: in an article by Paul Hoynes on cleveland.com, it was stated that the Indians have been encouraged by Michael's recovery. Michael is encouraged, too. "in the offseason, people know i love to hit. i hit a lot. it's just been a change in my timetable. when i get to start swinging the bat (again), i have a great routine i'm going to go through and i'll be ready to go." the timetable in this article claims late April or early May. 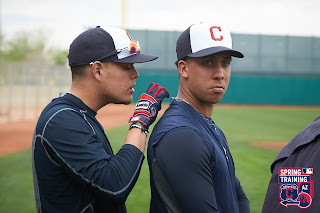 February 14: in Jordan Bastian's newest article on indians.com, he wrote what Terry Francona had to say about Michael's return date. "i think putting a timeline on it is probably not fair to him. when he's ready to play, we'll put him in there. he's really eager to be ready quick and we're glad about that." February 16: with Bastian now currently in Arizona, he spoke with Indians hitting coach, Ty Van Burkleo, who said Michael is out in Goodyear and he looks great, but hasn't progressed to hitting yet. Bastian spoke with Michael as well and tweeted that he hopes to pick up a bat "soon," but doesn't know a specific date yet, and that he hopes to surprise people with his comeback. from a video on indians.com, Bastian further mentioned how Van Burkleo is surprised at how much activity Michael's been doing. Michael's eager to get a bat in his hand, and that step could be coming sooner rather than later and maybe earlier than was anticipated. at the mini-camp in January, his activity level was a lot higher than people expected it to be. Van Burkleo has monitored Michael in some strength test exercises, and some of the things that Michael's already passing, Burkleo would say, "if you can do that, you can pick up a bat." but it's not about the ability to pick up a bat now, it's if he were to do that right now, what's he gonna feel like in July? that's what they need to guard against. February 17: on the day that Indians pitchers and catchers were scheduled to officially report to Goodyear, Bastian's twitter was full of update tweets about Michael. 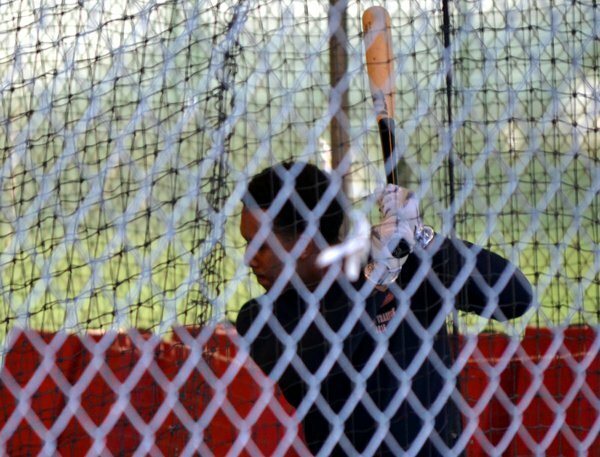 he first tweeted the moment Michael stepped into the batting cage, with a bat in his hand, and took non-contact swings as Van Burkleo and a team trainer watched him. Bastian revealed that Van Burkleo said Michael has actually done a handful of dry swing sessions and that today wasn't the first time. Van Burkleo called it "very encouraging." Michael is not on a strict hitting schedule yet. 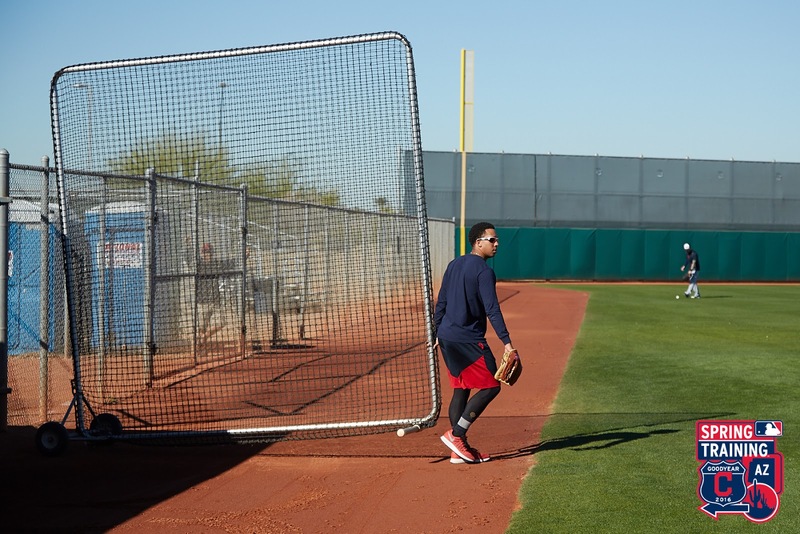 the Indians medical and training staff will assess how he feels each day and go from there. 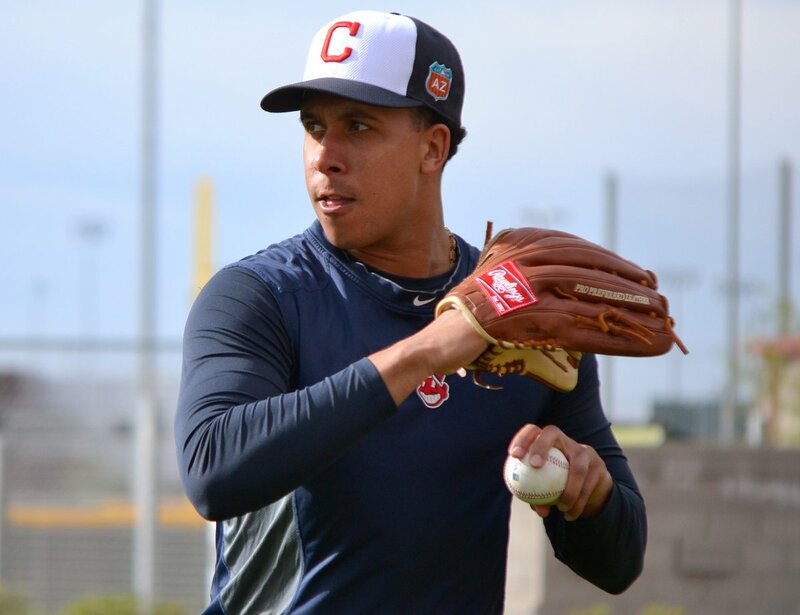 "it's just a good sign to see that he's this far along in his rehab, that he's able to go out and take dry swings," according to Van Burkleo from Bastian's evening article on indians.com. "and he's getting closer to transitioning to hitting off a tee and doing the stages to getting to where he's taking bp, and then getting in a game. it's encouraging to see where he's at. he's done a really good job of rehabbing it and getting it to where he's at this point." a dry swing consists of simply swinging the bat through the air with no pitches coming at you. the specifics of Michael's dry swings go like this: he moves into his stance, focuses on the part of the tee where a baseball would normally sit, then repeats his swing for a couple of minutes before stopping and taking a break. today, he went through a few sets of swings before going back inside the clubhouse to continue his rehab program in the trainer's room. as suggested in one of Bastian's earlier tweets, Van Burkleo disclosed that Michael began hitting in this capacity "a few days ago." because Michael's not on a strict hitting program at the moment, the medical staff and training staff are planning things in relation to how he feels. if the team feels as though rest is more beneficial to Michael than increasing his workout intensity, then days off from hitting can be taken. it's imperative for Michael to pace himself and not push too hard too soon. "that's our job, and that's our medical staff's job," indicated Indians GM Mike Chernoff. "it's on us to make sure that we do this for the long haul, and that it doesn't end up being something that lingers because we rushed his rehab process." despite Michael's right shoulder not being his throwing shoulder, it still bears importance in the mechanics of his swing. "his bottom hand is really what he likes to maintain and do drills to keep that where it needs to be," informed Van Burkleo. "so yeah, that bottom hand is important." "everything has been encouraging so far," Chernoff proclaimed. "he has been super diligent in his rehab and has put himself in a position to get on the field as early as possible. he committed himself completely this winter. he came into Cleveland. and, given the kind of leader and type of person he is, it's not surprising at all that he did that. but it's still important and encouraging." Van Burkleo concurred. "knowing him and his makeup and how hard he works, and our training staff, how diligent they are, i'm pleased, but i wouldn't say i'm surprised [by his progress]." 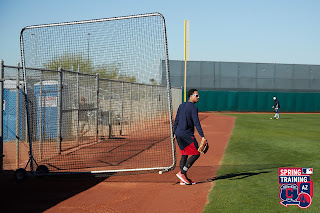 February 18: via Bastian, Francona stated, "he's doing really well, which is not a surprise. i hate to say he's ahead of schedule, because i don't think that's fair to him." per Hoynsie, Tito continued, "he's got a lot of hurdles to clear. next week he graduates to the next level, but he's doing really well." Michael went through a workout, watched the guys take bp, but took the day off from hitting drills. Hayden Grove provided video of him throwing the baseball at the complex. February 19: Grove tweeted that Michael took more non-contact swings in the morning, hitting a tee without a ball on it. he also commented that Michael's swing looked the same, and he didn't seem limited or as though he was favoring anything. February 20: and we have contact! 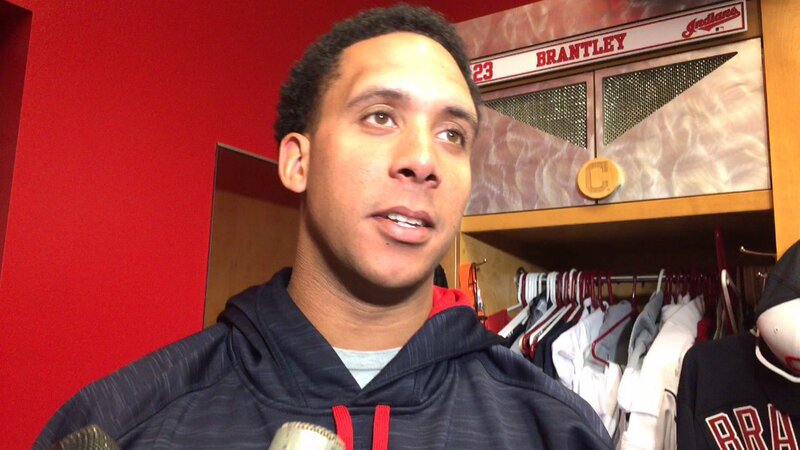 Bastian tweeted that Francona said Michael started hitting off a tee. WOW! that's really ahead of schedule! February 21: Bastian said Michael took the day off--the official spring training report date for position players, btw. Hoynsie posted an article on cleveland.com late in the evening with more quotes from Francona on Michael's progression. "he's coming quickly. he's put so much time into it, he's been so diligent. now you can't rush what you can't rush, but the minute he's ready to move on, the trainers let him, and he's going quick. the progression will continue and whenever he hits a milestone, he'll progress to the next thing. the idea, and it's kind of common sense, is that you're trying to build intensity and at the same time volume. but probably not both on the same day." February 22: Bastian tweeted that with the exception of his solo hitting program, Michael went through the daily workouts with the rest of the team. here is a short video from Grove of Michael working out. Michael also hit off a tee in the cage in the morning, smiled, and gave reporters a thumbs up as he headed back to the clubhouse. prior to his workout, Michael finally met with the media in the morning and he was clearly in a great mood. "i feel great," Michael began, beaming from ear to ear. "it feels like it was going very slow. it's a long process but a good process. the training staff has me working hard and i'm excited where i'm at right now." when asked about getting clearance to start hitting activities, he shared, "it's very nice. i missed not picking up a bat, not being able to swing a bat. like i said before, it's something i do a lot in the offseason. i pride myself on hitting, getting ready for the season, so any time i have a bat in my hands, i'm happy." to replace his offseason workouts, he did, "rehab. just rehabbing, making sure i did everything that the trainers asked me, that the doctors scheduled that day, and even if i could do a little bit more, if i could ask to do a little bit more, i did. anything to try and get an extra step ahead." Michael hopes to start contact swinging soon. "there's a whole schedule laid out. i know we gotta go over it and kind of see how each day lines up. i'm not quite sure what happens, what's gonna go on from here right now, but we should be starting to hit some baseballs here soon. "i hit a couple balls on Saturday, felt good. i'm happy where i'm at. it's a slow process like i said before, but you got to take baby steps and we took the first step already." of course someone in the media could not let this interview go by without asking Michael if he has a target date for coming back. "i want to be back as soon as i can, and that's Opening Day. and if it's not Opening Day, whenever i can get back to help my teammates. they're working real hard in spring and so am i, and the sooner i can get out there with them, the happier i'm gonna be and hopefully they will as well." then the same media member proceeded to ask if Opening Day was realistic. "i won't give myself a target cause i don't think it's fair. i know i'm gonna work as hard as i can to be out there with my teammates. so whenever that day is, i'll be happy. "we have a schedule that's laid out each and every day and we do a great job of communicating back and forth, just how i'm feeling, what we're gonna do today, how certain activities or certain things put stress on my shoulder and how i responded from it. everything's going well which i'm very thankful for. i had good surgeons and a good athletic training staff, so i'm very happy where i am." this offseason could not have been more different from the usual in terms of Michael's preseason preparation. "i usually have a routine where i start hitting in November, when i start swinging a bat. so not being able to do it, yeah it was a little bit different. it's something i've been doing for a long time but at the same time, i hope that all the years of repetition it won't take me too long to get back to where i need to be." Michael is aware, however, that he just might not be ready come Opening Day. "if i'm not out there, i'm going to be the biggest cheerleader i can be. hopefully, i'll be around my teammates so i can make sure i can give any advice or help them in any way. "it's something i've dealt with before. it's not my first surgery. i think it's very important to make sure that you're 100% before you get back and make sure you take all the necessary steps in the rehab process as well." Bastian's daily article on indians.com elaborated more on what Michael thought about the [winter meetings] rumor that he could potentially be out until August. "it was something that was kind of far-fetched. i hope that doesn't come true. it was just something that was kind of misreported." 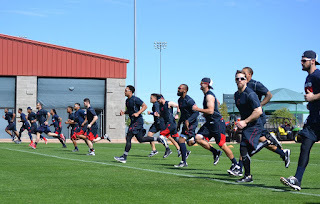 as for what's next, the Indians have their first full squad workout on February 23, and Michael plans on doing as much as possible. aside from his gradual hitting program, he's able to run, throw, and field without restrictions. "i plan on doing everything that everybody else is doing, except for i have a different hitting program than most. i plan on taking my outfield drills and doing everything with the outfielders, so i'll be around my teammates." Francona discussed Michael's rehab process with him in the morning also. "i love the fact that he's pushing because i think he's getting better quick, which is good. but, i think he's got a good grasp of things. he's already assured us that he'll be very honest and that's good enough for us. there's a lot of trust there that he's built up, as should be. he deserves that." is that enough info for ya? too bad cause i've got more. on cleveland.com, Hoynsie posted an article in the evening with an excerpt about Jason Giambi's thoughts on Michael's swing. "he had me come in and look at his swing. he wants to make sure he's doing everything right. even though everything is slow, you still want to do it right. he looked really good. he looked really free. it didn't look like he was babying it at all." in a second Hoynsie article, it was unveiled how Michael initially felt about the need for surgery on his shoulder. "it just wasn't feeling right. i wasn't feeling stable enough where i felt confident enough in my shoulder that i was going to last a whole year. i thought i may have been able to get away with it, but at the same time i wanted to be healthy." February 23: on the day of the first full squad workout, Michael participated in the endurance test, running 40-yard timed sprints (20 back and forth) between cones. players must complete each lap before a beep goes off. the last man standing, wins. Michael was among the final handful of players. February 24: Grove provided a short video of Michael doing defensive work. he's the first guy fielding a ball in the vid. 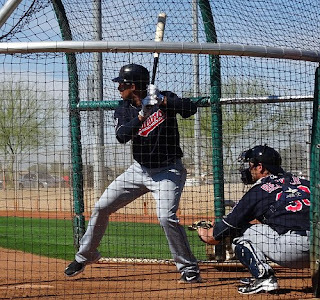 February 25: Bastian included an excerpt in his article on indians.com stating that Michael continues to make progress in his rehab, but is still limited to hitting off a tee. 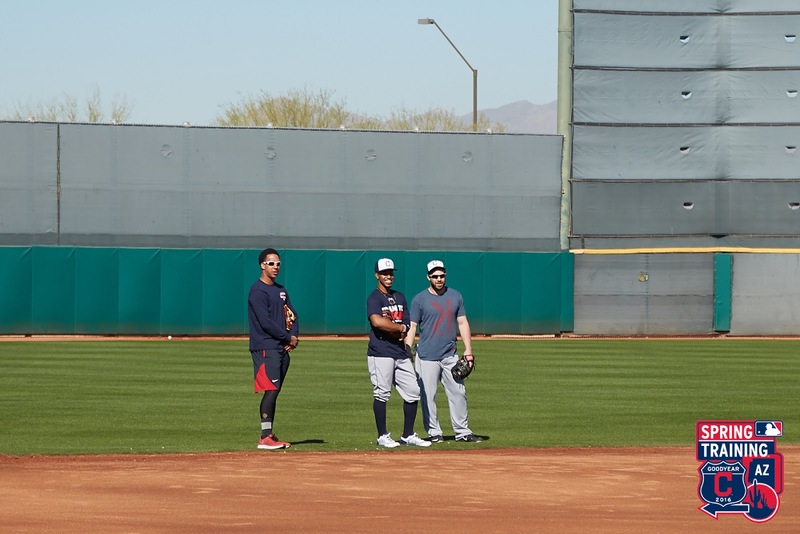 February 26: Grove provided a video showing all the Indians outfielders, including Michael, working on running the bases. February 27: in an excerpt from Bastian's article on indians.com, we finally got some NEW news! lol he reported that Francona said Michael is progressing really well and will be "moving up to soft toss in the next few days." February 28: Michael was in the cage for live bp, but didn't swing. additionally, Michael practiced throwing his outfield assists in this video from Grove. 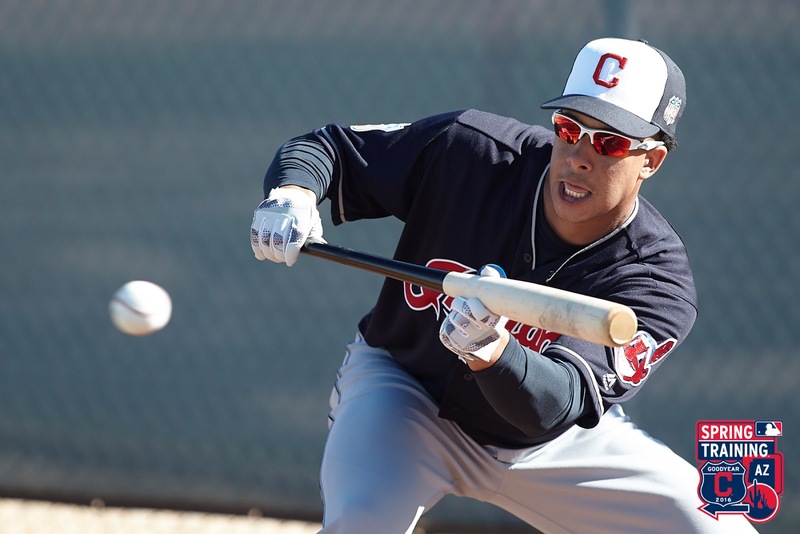 lastly, from a cleveland.com article by Hoynsie, Francona said, "every couple of days, whether it's intensity or the amount, [he] seems to be growing quickly." February 29: Bastian tweeted the great news that Michael moved up to soft toss hitting drills! a short video was later posted on indians.com (but was not recorded on this actual date) of Michael in the Indians media room. of his recovery, he said, "i'm doing great, making progress each and every day. i'm on a good game plan with the comeback, swinging and hitting, and i'm excited where i'm at. i really am." Michael further talked about how it's important for the team to bond this spring and expressed that he's willing to help any young kids in camp in any way he can. so here we are, at the end of February. Michael wasn't even supposed to pick up a bat for another 9 days lol, yet he's already taking soft toss bp. he couldn't be doing any better than he is right now. let's just hope everything continues to go well with his rehab and that there aren't any setbacks. i feel as though i also have to take a second to apologize for the length of this blog. when i started it, i honestly didn't think there would be this many updates and quotes to have to include in a monthly update blog. but because Michael is weeks ahead of his originally projected rehab schedule, there's an abundance of info here, and had i known this, i would have split it into at least two blogs. sorry!